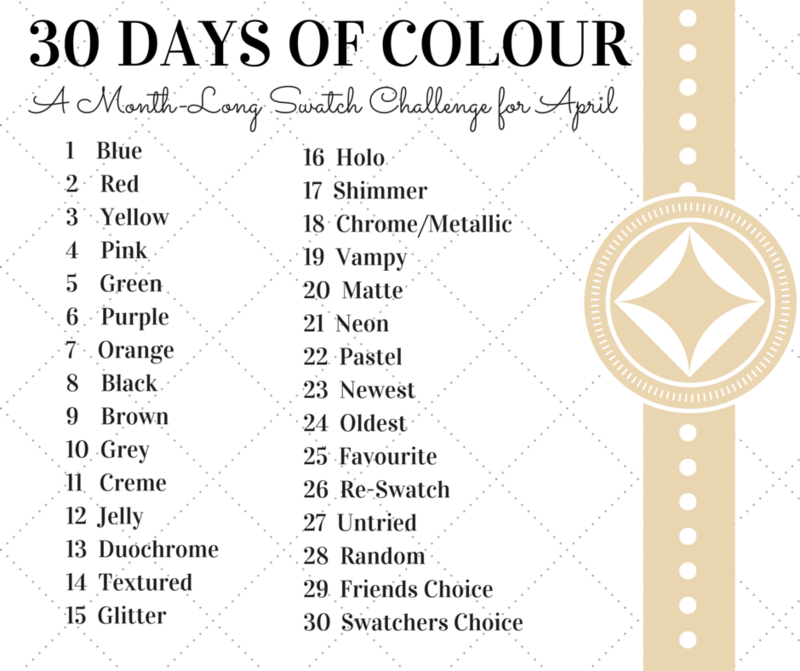 Day 3 of the 30 Days of Colour Challenge is 'Yellow'! I'm extra happy about today's post because not only do I love this polish but I also got my camera and lighting to cooperate again! Can you believe these pics were literally just cropped? No colour editing needed to make my skin not look like a lobster or ghost! Woohoo! On that positive note let's jump in to it! 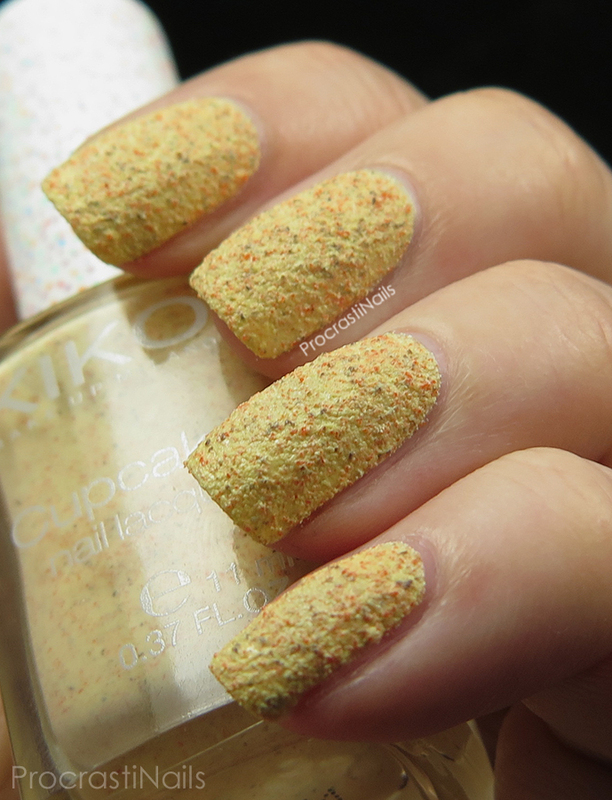 This is Kiko Cupcake Nail Lacquer 648 Pineapple which my lovely friend Inés from Càrritx i Roses sent me ages ago. 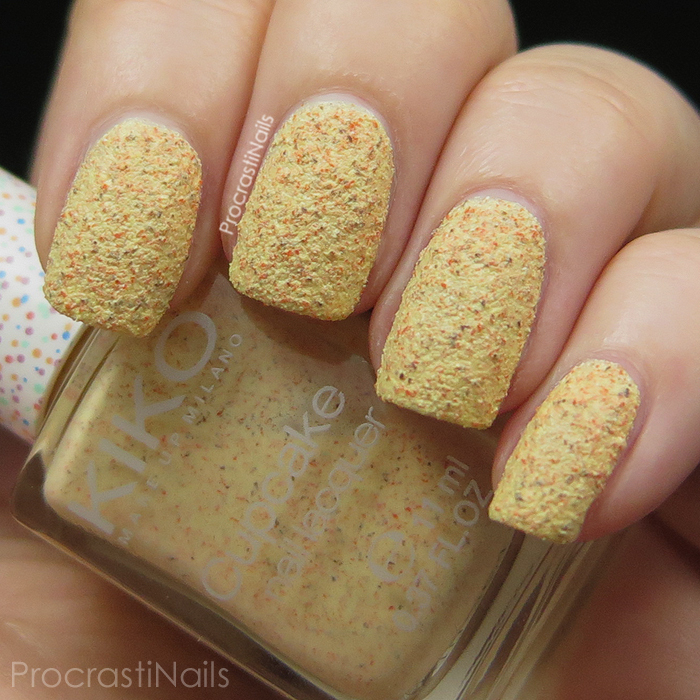 She's in Spain and I'm in Canada and periodically we send each other lovely little packages, and some of the Kiko Cupcake polishes were sent to me because she knows of my love of textured polishes and pastels! 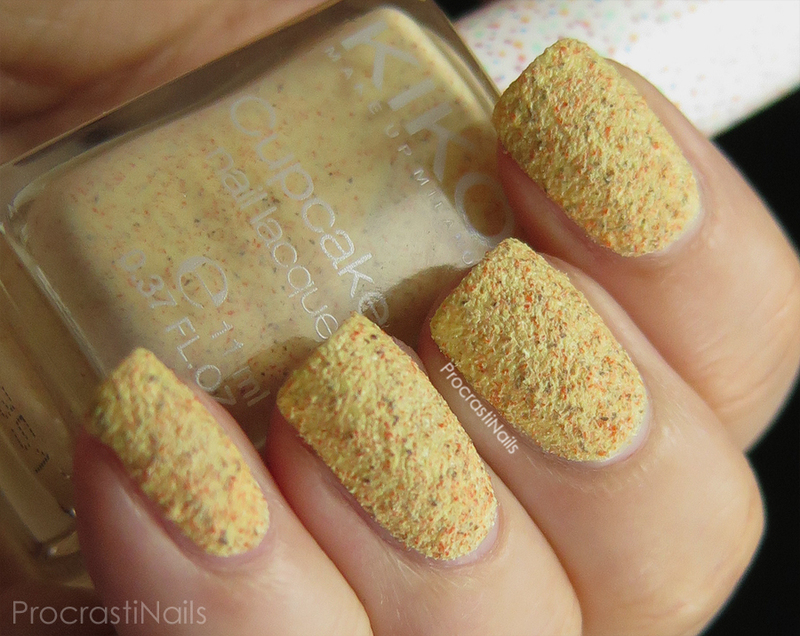 This lovely polish has a slightly crelly yellow base packed with yellow, orange and brown textured bits. I used three coats to build it up but you would probably be good with two as long as they're moderately thick. As with a lot of textured polishes this is one you have to be careful with after the first layer - you need a good dollop to spread subsequent layers because it will catch and build up in certain places otherwise. I really like this polish, and pulling it out for this challenge reminds me of all the lovelies Inés has sent me that I have yet to use much. I also have a pink and blue from this same line and I think they're begging to be used in a last minute Easter mani! I really feel like I've got my groove back with this post, you guys. And I'm really happy about it. :) Here's to oodles and oodles more lovely posts coming up in the future! Woo! What a fun color! Not a fan of textured polishes but you make this look nice and interesting! I like how it looks on you, though I like my textures with a bit of sparkle! I shouldn't like this color because yellow, but I'm totally digging it and now I need to go find it. Also, congrats on fixing your lighting problem! It does kind of look like scrambled eggs! Especially in the macro! 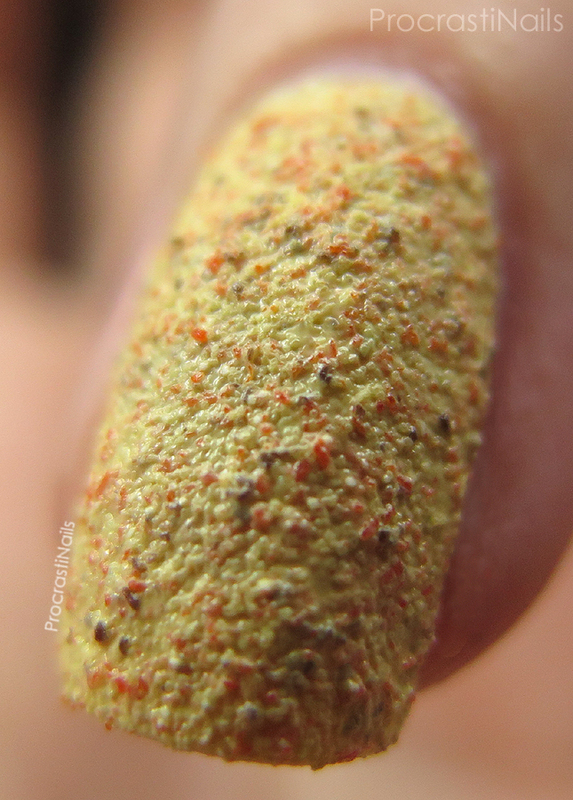 In the macro shot it looks a bit...unpleasant haha But I love how these look from a normal viewing distance! This is such a cool polish! It's like the NOPI Roughles and I still have never worn the one I have. Now I want to! Theres something about this polish that makes me love it and think it's odd at the tame time. At first look it reminded me of scrambled eggs. I love the uniqueness of it. Congrats on fixing your lighting issue. This is very fun, I love the colour! As for textures, my preference goes to the sparkly ones. I would like to see this one with top coat as well, lol, but that really defeats the purpose of textures haha! I love textures and this is very fun and Easter-like! 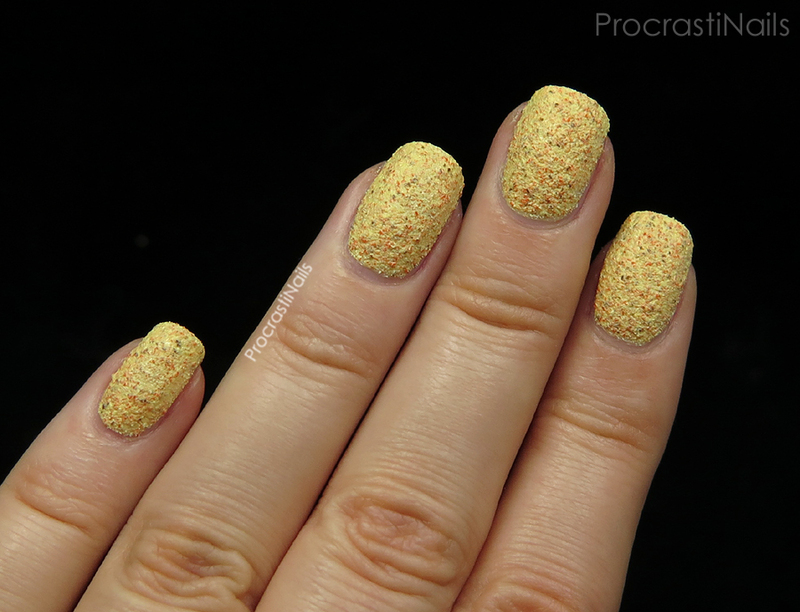 I'm such a sucker for a effortless texture polish like this, it looks gorgeous on you. Yay for getting your camera to capture it correctly.